Vacation rental house. Sleeps 6, 3 bedrooms, 2.75 bathrooms. No pets allowed. Sit and soak in this gorgeous scenery just steps from your front door. 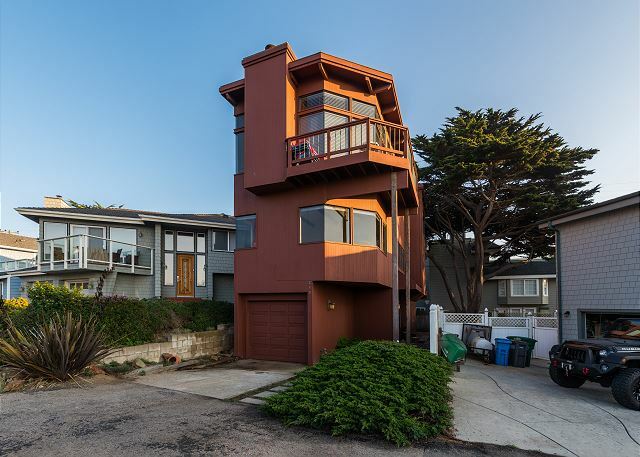 Just steps from state-preserved coastline, this contemporary and restful three-story house is a short walk to Cambria’s best attractions: Fiscallini Ranch, Shamel Park/Pool, sandy beaches, tide pools, and quaint shopping. 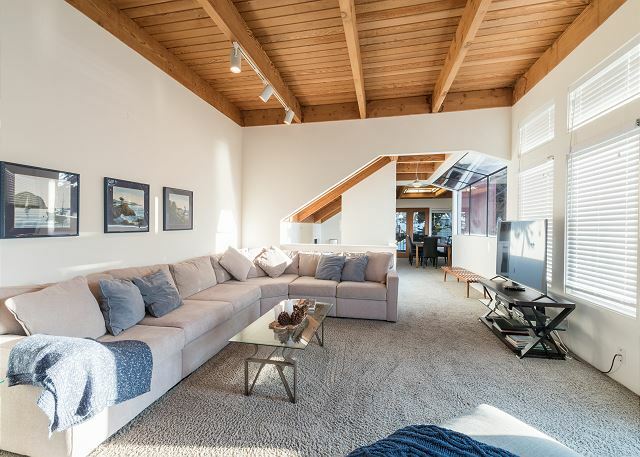 Three stories high, the top floor living area boasts MAGNIFICENT VIEWS, which are accessible to all by ELEVATOR or stairs. Enjoy beautiful sunsets and BBQ on the upper deck, or soak up morning sun on the master bedroom’s private deck. High speed WIRELESS INTERNET. This home is not pet allergy free. 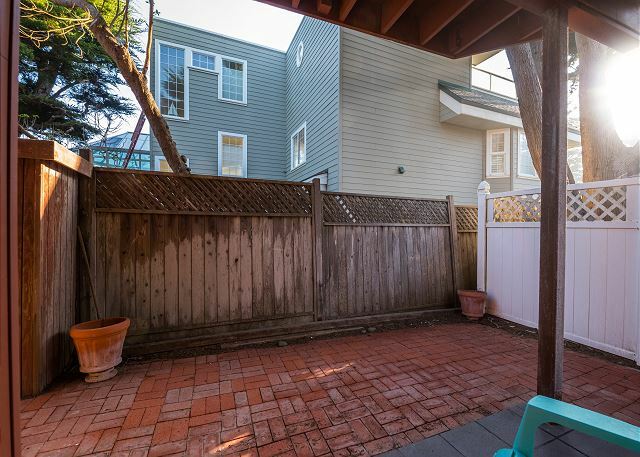 This home is located in a wonderful neighborhood, literally just a few steps from the ocean. The design of the home provides fabulous ocean views even though there are houses between it and the water. We were vary happy with our stay here and highly recommend it to others. Not much more to say, but everyone had a great time and we all hated to go home. Easy access to the park or walking trails. Breen Realty personnel were very friendly and professional. You can't go wrong! This was our second stay at "Elevation". We appreciate all the improvements the owners have made since our last visit: new beds, dresser, TV, Alexa. This house was perfect for our annual 4th of July family trip. The house is three stories with the living room, dinning room and kitchen on the 3rd floor which may seem daunting but that it all mitigated by a working elevator which the kids loved! 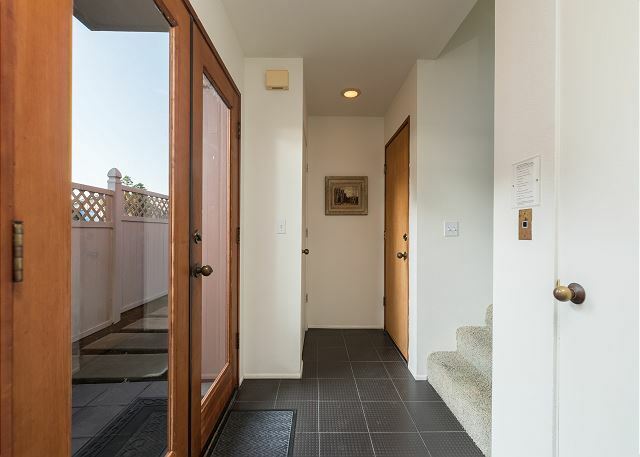 The second floor has two bedrooms, including a master with a en suite bathroom and it's own deck. 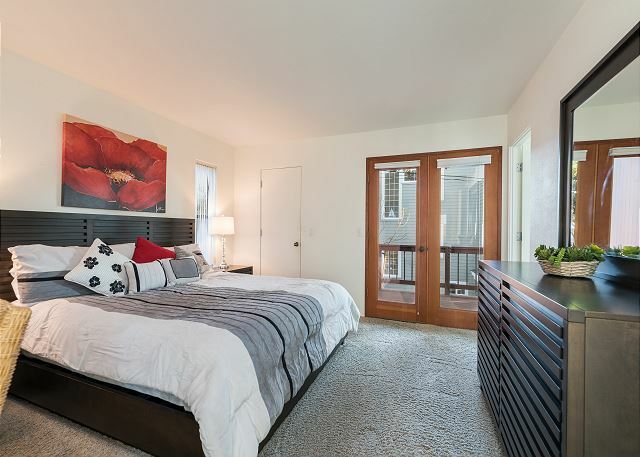 There is a large second bedroom and guest bath on this floor as well. The first floor has a one car garage and another bedroom with a smaller bathroom. 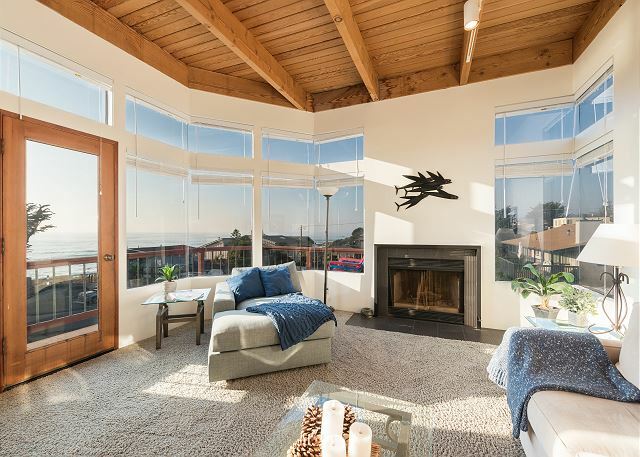 But the real gem of the house is the floor to ceiling windows in the living room which looks out on the fabulous Cambria views. We had the best view of the fireworks from the living and deck. All-in-all a great family house and enough room for the 6 of us to not feel cramped. Would absolutely stay here again. I wrote a 4 page review and returned it with 2 keys when we checked out. Please refer to that. Please note that house has 2 Queens and 1 King, not 2 kings. Martin J D from fairfield, CA does not recommend this vacation rental. We arrived only find that the electrical was not functioning in the master bedroom. This was also where the location of the wifi modem and landline was located so we were without internet. Called immediately to advise the mgmt co but they had already departed. They called the next day and said they would fix it. Didn't get fixed until the third day of our visit. Mgmt co said they would get us a partial rebate but never got to us with a rebate or a courtesy call to tell us they were not going to do so. Would not go through them again. The property was great for our group, loved that each bedroom had it's own bathroom. The windows need to be replaced as the seals are broken and the windows are cloudy (which makes it harder to see the amazing ocean views)! Fabulous location, kitchen well stocked, beds very comfortable and an abundance of towels. The windows are in need of a good cleaning so that the view may be enjoyed. All in all, super comfortable and easy living while in this lovely home. This house was comfortable and met the needs for my family. The kitchen was well equipped and there was plenty of room. The house is a few blocks away from a park that my children enjoyed. Great time at this location. Elevator allowed for my 89 yr old mom to be able to have a visit to the coast and sit and see the ocean. The house was clean and well-located. Our only disappointment was that the windows were so dirty/permanently fogged over that we couldn't enjoy the view of the ocean. 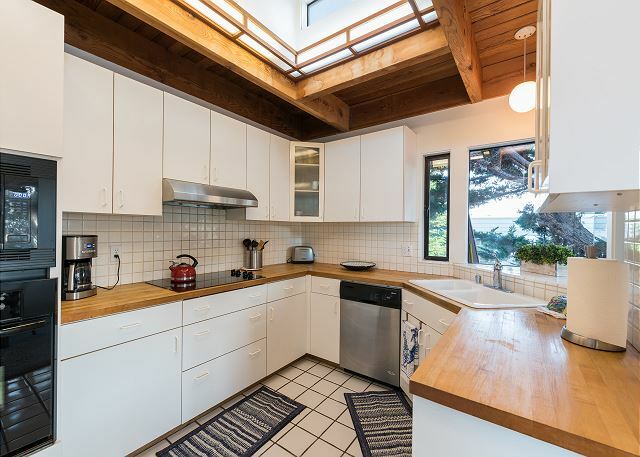 This home is in the perfect location, just steps from the ocean and breathtaking views. The home is clean and comfortable. We had a great time experiencing the views from the house and the easy access to the beach for sunsets! We also enjoyed wine tasting during the day and enjoying a glass of Paso Wine while watching the waves crash on the beach. A WONDERFUL STAY! I reccomend Breen Vacation Station. A family member had a difficult time going up and down the stairs because the elevator was broken on our arrival. 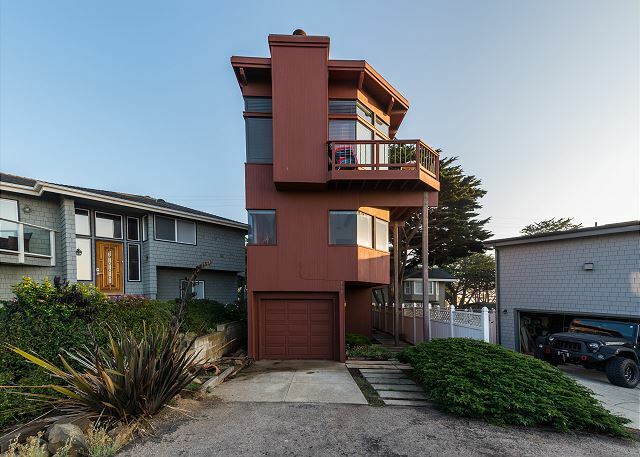 The Breen manager offered to move us to a different home but we loved being so close to the ocean and we loved the "Elevation" home that we decided not to move. "Elevation" is a very modern home with a beautiful location. We enjoyed the location and the many walks in this very quiet community. 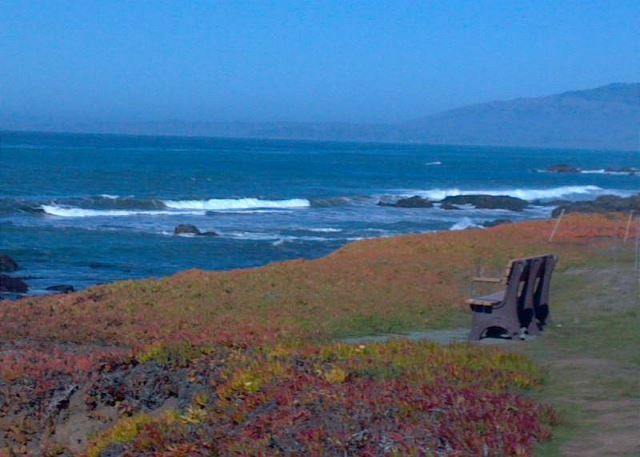 We will be back and we will use the Breen Vacation Station for our next stay in Cambria. Great quiet location. Easy access to town and activities. Unable to use garage, garage door needed adjustment. Unit was nicely equipped. Overall it was a very delightful and relaxing stay. The kids loved the sounds of the ocean and the beautiful view from the third floor. Great house. Great views. Great time. Really great home for being a bit of an older home. Nice view of the beach. a guest from Fresno, CA does not recommend this vacation rental. Nice location & layout. Elevator comes in handy when carrying groceries to the kitchen located on the 3rd floor. Bathrooms and kitchen were clean. Kitchen could be stocked a bit better. No paper napkins or spare paper towels available. One bedroom was flooded due to the washer being broken before we got there, couldn't use the washer and could barely use the room. Living room couches were a bit stained, makes it look dirty. Cable TV and wifi not working due to bill not being paid. No hand towels in one of the bathrooms. Nice view from living room, would be even better if windows were clean. Trash bins were already full when we arrived, had to leave trash in garage. We love this house; we've stayed here four times (so far). 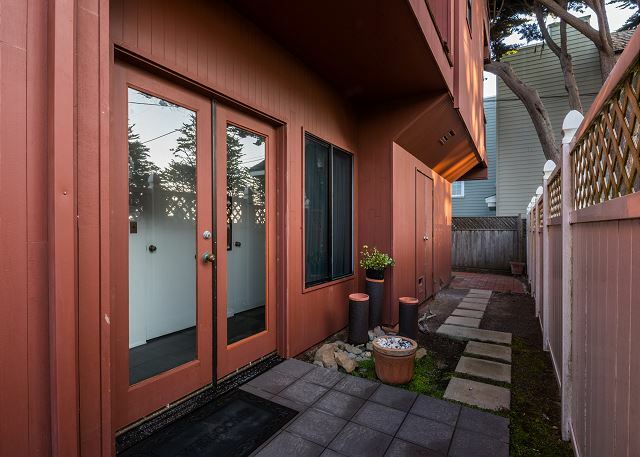 The view is fabulous, and the location is within walking distance of both Fiscalini Ranch and the West Village (I would say easy walking distance but not everyone loves to walk as much as we do). We've been so impressed by the responsiveness of Breen's staff to any problem. Four years ago the house was a little shabby and unloved; the owners have made many improvements since then. Pat S from Bakersfield, CA does not recommend this vacation rental. Perfect location, but in need of upgrading and tending to small details. Perfect view, great location, lovely town. We'd stay again, but only if the windows and decks were clean and certain other maintenance issues were resolved. The house also would benefit from a basic staging to spiff up the bedding, replace the worn and less than comfy living room sofa, and hang a few well placed pictures. Oh, we loved the elevator!! It was perfect. Exceptional ocean view. The home was warm cozy, we enjoyed the fireplace, the third floor offers an amazing view of the ocean which was the perfect place for our meditation practice. Fell in love with the home and where it is nestled. Sheer delight. This is the third time we've rented this house. It's comfortable, clean, and quiet, and the view is incredible. We always wish we could stay longer. Breen's staff is wonderful to work with. We really appreciated the upgraded appliances this year. Excellent view and very clean. Need a new TV remote since buttons cannot be read, a cable guide, and an updated TV (it's close to an antique and it's bowl season). New kitchen sink stopper would also be nice. All in all a very pleasant stay! We had perfect weather in the perfect house. This is our second time in the house and it was great. There were only 2 issues. One bedroom window is broken. And, even we were told there was wi-fi, we didn't have it until our 3rd day. We will definitely stay here again - its a marvelous house in a perfect locale! This (3) story home had almost everything we needed over Christmas. With the exception of an icemaker and not enough wine glasses the elevator in great working condition was very nice. A very lighted Hearst Castle was able to be seen on Christmas Eve. and only 50 yards from the beach. Great location. Great service. It would have been better had the jacuzzi tub had been working. This house was in a very nice area and the view of the ocean was beautiful. It was very accomadating for the three couples that stayed. 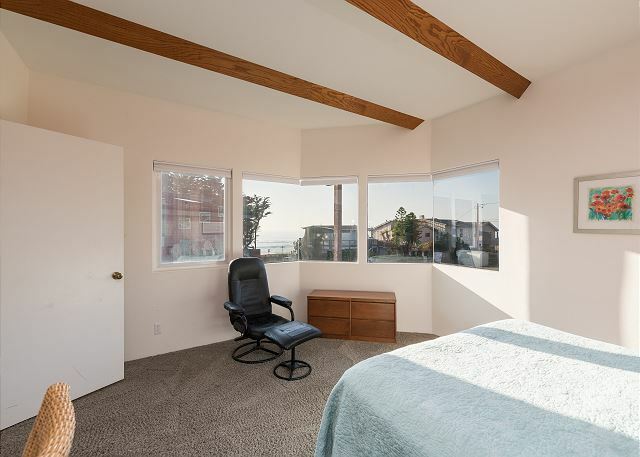 The home could use a little updated and the windows should always be cleaned before a guest arrives, due to the ocean view. Thank you for sharing your property with us. We would stay again. We had a good time staying in this rental house. It has great location with easy access to the beach. The house is clean and the property mgmt is very helpful. We'll love to rent this place again and definitely recommend it to friends. GREAT PLACE GUYS!! WE LOVED IT!! TWO THUMBS UP!! cost of a few nights rent the place could be awesome. We came for the ocean, and Elevation held up its end of the bargain in that respect. Close to the beach and awesome views. The staff at Breen were wonderful from start to finish. Our complaints were that there were not basics in the kitchen for cooking (such as olive oil, tin foil, coffee filters, etc. ), we ran out of available trash bags (and recycling bags), and the candles were not in usable condition in the living room. The carpet could stand a good cleaning as well. We loved our stay in this house and in Cambria. The kids were the most excited about the elevator but the views are incredible, and there was plenty of room for everyone. We had a great time. The upper level of the house with all the windows and views were terrific. 6 people were comfortably accomodated. 1/2 block access to 2 trails and nearby Shamel Park were a bonus. Adding a second queen or new sofa sleeper to the queen bedroom would be a big improvement. All in all it was a delightful house to stay in. We were a group of 5 girls on our annual 3 day wine trip. This place was perfect for us. It had lots of room, spectacular views, and many amenities. Danielle at Breen Vacations was very helpful and answered our many questions before arrival. Our only suggestions would be to have some place in the second story bathroom to put toiletries etc. and to update the furniture. We will definately return. The view from the top-floor living room was amazing. The house was comfortable and quiet, and the elevator was very convenient for getting supplies to the top floor, where the kitchen is located. We would rent this house again in a heartbeat. A great location and good walking trail along the water. There were no towel racks in any of the bathrooms. The towels provided were dingy and/or threadbare. There was no cold water at the master bathroom sink. The windows were not clean. Great place beautiful home, comfortable --wish we could have stayed longer. Great location and amazing views. Property is showing its age however. Furniture and flooring are looking worn. The property is a great location for a family vacation. Cambria is a wonderful small town with fabulous restaurants and fun shops. The Moonstone beach walkway is a great place to exercise and view the harbor seals that haul themselves up out of the water to rest. The 3 bedrooms are very private and 2 have en-suite bathrooms with a 3rd bathroom being in the hallway for common use. 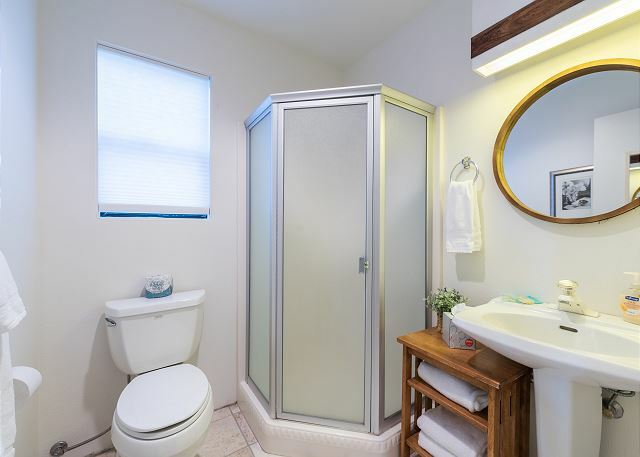 While the property is very comfortable and clean, the property's amenities (tv, dishes, furniture, etc) are very dated; most appear to be from the late 70s or early 80s. I would absolutely recommend updating the tv with a flat panel tv that has a working remote. The common bathroom also needs to have some maintenance done on the lights and the vent fan. Only the light attached to the vent fan worked but the vent fan was so loud that it could not be turned on in the middle of the night as it would wake everyone in the bedrooms on the same level. I had to use the bathroom in the middle of night with a flashlight. Despite my negative comments, I would recommend this property for a family or group of 3 different couples to stay. This house is great. The sunset view from the living room on the 3rd floor can not be beat!!! This home is 3 stories, the saving grace is it has an elevator. Quiet neighborhood, beautiful views. The beds are comfy!!! Our biggest issue was cleanliness. Had to wash all dishes before using. Not enough facecloths for 4 women. Steps to house are hard to navigate a rolling suitcase, this could be taken care of it we had been able to open the garage door. This home is not a good choice for handicaped. We had a great time in cambria. Our first visit but definetly not our last! The view was amazing! The house was clean and cozy. It was an overall great experience! The ocean view from the livingroom on the 3rd floor was amazing!! We had a great stay & enjoyed morning & evening walks to the beach. The nearby park & playground was great for our little nephew! The beds were very comfortable. For the most part, everything was pretty nice. A few suggestions for improvement, the windows in the livingroom should be kept clean so the guests don't have to do it, the sofa in the livingroom is outdated & a bit uncomfortable, and there should be more than 1 wash cloth in each bathroom. Also, the lid on the outdoor grill should be replaced because it is damaged. 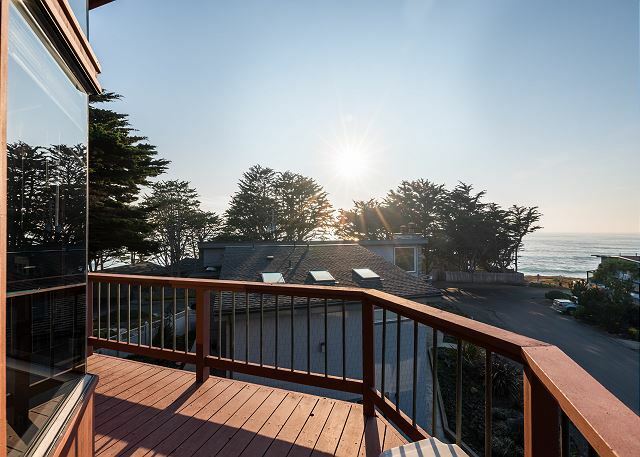 Those items aside, we liked the stay & would definitely revisit Cambria again. Thank you. Very nice House. Incredible view! During the stay there was a plumbing problem, but we were upgraded to another house at the same rate with the desired number of bedrooms. We were very pleased with how quickly the management responded to the problem. Great stay, comfortable, beautiful views. Our 2nd time renting. The view & fire place were awesome! The house is made for family to make memories-patio, bbq, dinning, fire place & walk along the beach. We loved the place. great location, great view of the ocean and great layout that worked great for the group. Every one wants to come back and spend more time next time. Overall, we enjoyed the weekend stay. The view was spectacular and the community park was so close, the kids loved it. There are definitely things that needed attention in the house though. The kitchen didn't have very many usable pots and pans, there wasn't any dish washer soap, and the property manager had to bring us a grill brush for the grill - that was filthy and full of ashes. The couch had a lot of weird looking stains on it - it would be better to get a dark colored couch or leather sectional. 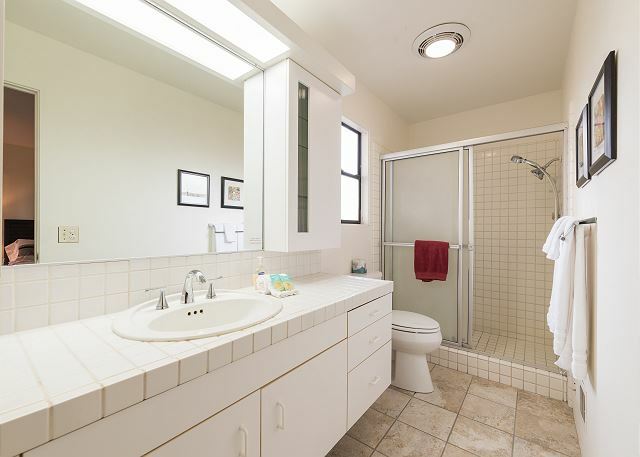 The bathrooms were fine except that there weren't enough wash cloths - again the property manager had to bring those by. There were also a lot of exposed wiring and some outlets that weren't covered. With kids, this is definitely a high risk problem. The elevator was really cool and convenient for getting an ice box up to the kitchen. I figure it's an old house and the owners must not visit often. 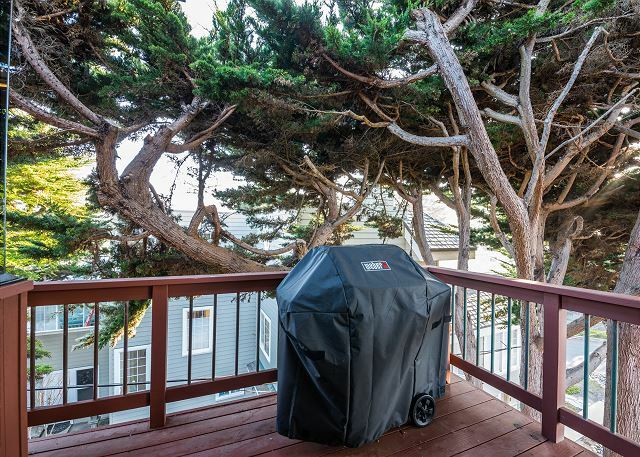 I've rented other houses in Cambria that were in better condition, but for the location and price, I think was reasonable. A great vacation...thanks a million! We've stayed at 12 houses over the years and the location of this is tops. We usually stay in the houses on Windsor Estates. This house needs a little cleaning inside. Granted, it's a rental, but the carpet is very dirty and stained. The couch is just as bad. Throw pillows are quite dirty. Cobwebs abound on the high ceilings. Beds were clean and comfy. Elevator was a nice bonus. Nice house, great location, just needs a good cleaning inside. I contacted Breen Rental regarding needing a home that would have a great view. Bob was outstanding in finding the right property that fit us. I was taking my father who uses a walker and my mother who has demetia. I explained to him that stairs would not work for us. Bob then said I have a home with a elevator. It was perfect! The view was outstanding, my mother and father had a wonderful time. It was a trip that was all about them and a memory that will never be forgotten. We will be doing this every year as long as they can. The house was comfortable, convenient, and well-stocked. If I were the owner, I'd be thinking about getting the windows washed, replacing the badly-spotted carpet, and replacing the living room furniture. The housekeepers obviously do a great job of cleaning the place, but renters are messy people, and the carpet is beginning to smell a little. Overall, a good stay, and we appreciated the Breen staff's welcome. We'll call Breen again. We really enjoyed our stay and hope to return soon. The house and view were amazing. The only thing that could increase the value of the property is updated furnishings. Bob at Breen was very helpful and I would recommend working with him to all of my friends and family. WE HAD A GREAT TIME IN CAMBRIA. THE HOUSE WAS ROOMY AND SPACIOUS. WE WERE CLOSE TO THE BEACH AND TOWN. HOPE TO RETURN FOR A FURTURE VACATION. THE AREA IS BEAUTIFUL. Breen Realty is the best! A pleasure doing business with you. We all had a lovely time at Elevation. We love Cambria! It could use a good cleaning. The flower pots on patios full of cig butts, carpet filthy, furniture worn. The towels need to be in the bathrooms, not closets. Just a few minor details but a great weekend spot and we'll be back for many years to come. Terrific location. You can see the waves and ocean from the 3rd floor level. Small elevator is a plus. Living room furnishings a bit worn. Would stay there again. The house has a wonderful view of the ocean and breaking waves, and the waves are audible from the street-side room and living room. The elevator is handy for luggage and groceries. The beds are comfortable, but the showers were built for short people!! The trash (from the previous occupants) was removed from the living quarters, but remained in the garage for the duration of our stay. (The cans were outside.) As a result, I was not able to park in or store things in the garage as I would have liked. Also, the couch and carpets are in need of steam cleaning. Overall, it was a great house for the money that we spent, and I would probably stay there again. The house was great, open sunny and close to the beach. Great! My preference is always a vacation home above a hotel and the space a amenities at their location spot were nothing short of just right. great location & view, windows all very dirty but management came and cleaned them. overall great place! Spectacular view from the top floor. Pity the windows were not cleaned before our stay as it hindered the view. there was a slight musty smell in the lower floor. Otherwise we had a fantastic time here, seeing whales from our upstairs windows and patio. a guest from American Canyon, CA does not recommend this vacation rental. Stayed at this property in June of 2005 and again in June 0f 2007. The property has not been properly maintained. Major problems with the plumbing; one of the toilets should have been replaced rather than continually attempting to be repaired. The stairway carpets and upper floor carpets badly needed cleaning. All of the windows were filthy. Outside of that, our stay was fine. The amenities were first class and the house was quite spacious. However, through no fault of your company, we decided to chose another place with another company for our June 2008 stay in Cambria. Great place to relax and enjoy your surroundings! The house was a pleasure to stay in. The view from the third story balcony was beautiful and the short walk to the park made things better. The elevator made it easy to load things into the house. The staff was very helpful before and during our stay. They went over and above to make sure we got the house we wanted, for the days we wanted and treated us like family. I loved our stay and would gladly go back!